The North Carolina State Fair, created in 1853 by the North Carolina State Agricultural Society, was designed as the society's principal agency for the promotion of both scientific agriculture and industry. The initial fair was held on a 16-acre site approximately one mile east of the capitol in Raleigh that both Wake County and the city of Raleigh helped the society acquire. In 1855 the state legislature began to provide the society with an annual subsidy of $1,500 to help cover the fair's operating costs. The fair was an immediate hit with North Carolinians and, under the leadership of society president Thomas Ruffin from 1855 to 1859, became a fixture on the state's social calendar. The Civil War closed the fair until 1869 when, led by Kemp P. Battle, the Agricultural Society refurbished the fairgrounds and sponsored a fair. In 1873, again aided by the city of Raleigh, the society obtained a new fairground of 55 acres located west of the capitol on Hillsborough Street and next to the North Carolina Railroad. 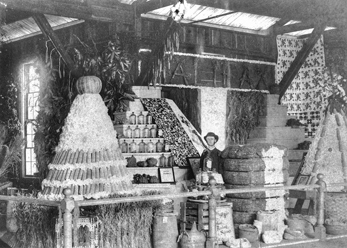 A virtually bankrupt Agricultural Society lacked the funds to conduct a fair in either 1926 or 1927, leading to a series of events that placed the fair under state control and at its present location. In 1927 the state legislature designated a 200-acre tract of land on Hillsborough Street near North Carolina State University as the fair's new home, and new buildings were constructed with funds from Wake County and the sale of the Agricultural Society's old fairgrounds and buildings. The fair reopened in 1928, and in 1930 it was placed under the control of the State Board of Agriculture. Seeking to avoid the expense of the fair, the state leased its operation to circus promoter George Hamid in 1930. In his 1936 successful campaign for state commissioner of agriculture, W. Kerr Scott promised to return the fair to state management, a promise he fulfilled in 1937 when he convinced the legislature to make the fair a division of the Department of Agriculture. The fair has continued to operate under the auspices of the Department of Agriculture since then, always enjoying strong gubernatorial support. Completion of the Dorton Arena in 1953, the fair's centennial year, provided a performance venue that was hailed as an architectural marvel and that quickly became the symbol of the modern fair. The 1970s also saw major additions to the fair's physical plant with the completion of the Graham, Scott, and Holshouser Buildings, each named for a prominent North Carolina political figure. From its inception, the state fair's emphasis was on instructing farmers in the latest advances in scientific agriculture. During the nineteenth century, the Agricultural Society sponsored lectures on a variety of scientific agriculture topics, including irrigation, crop rotation, chemistry in agriculture, and the need for practical agricultural education. Attendance at these lectures was poor, however, and well before the turn of the century the exhibit had replaced the lecture as the fair's primary method of educating the public. 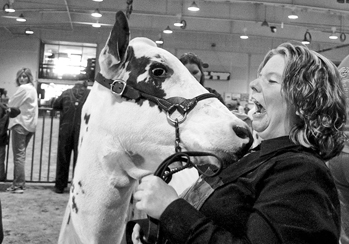 The fair became the state's premier showcase of blooded livestock, the most recent and efficient agricultural implements, and crop yields of superior quality and quantity produced with scientific farming methods. It remained the most important venue for introducing the state's farmers to the latest developments in agriculture even after the founding of other agricultural educational institutions, such as North Carolina State University, in the late nineteenth and early twentieth century. The fair, however, never became the significant showcase for industrial development that its founders had envisioned. While some industries did exhibit at the fair, the majority of exhibits continued to feature livestock, crops, and agricultural products, implements, and processes. One of the Agricultural Society's original goals for the state fair was social, to provide an event that would attract and encourage interaction among people from all sections of the state. In this, the fair succeeded admirably, and its social appeal quickly vied with, and soon surpassed, its significance as an instructional institution. The antebellum fair attracted crowds with simple, homegrown entertainment. Marching bands and parading military units representing North Carolina cities, horse races, and political orations, frequently by the governor, became staples of the nineteenth-century fair. By the turn of the century, the modern midway had emerged, with its "freak" shows, girlie or "hoo-chee-koo-chee" shows, thrill shows, and featured attractions. Although independent attractions continued to play the fair, in the twentieth century the entertainment became even more organized. George Hamid, owner of a circus and Atlantic City's Million Dollar Pier, supplied circus-type acts for performances at the fair's grandstand from 1929 into the 1960s, and in 1948 the James E. Strates Shows contracted to supply most of the midway's shows and rides for a number of years. The fair also continued to attract politicians, including presidential candidates William Jennings Bryan and Franklin D. Roosevelt and Presidents Theodore Roosevelt, Harry Truman, Gerald Ford, and George H. W. Bush. Especially in election years, both the Republican and Democratic Parties continued to appeal to fairgoers, and many of their candidates for statewide office appeared there. Fair week has ever been, and remains, an integral part of the social life of North Carolina and the capital city of Raleigh. It is a week of parties and politics, organizational meetings and reunions, college football and cultural events, and crowds of North Carolinians representing communities from every corner of the state. The Agriculture Society's concept of an instructional fair, modified by the public's demand for a festival, has resulted in a genuinely unique institution that belongs to and is esteemed by the citizenry of the state. In 2005 the North Carolina State Fair boasted an attendance of 796,000 visitors. 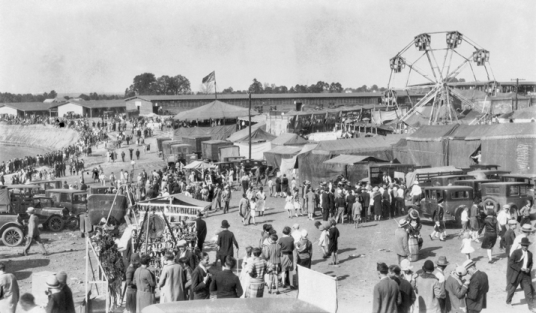 Among the many events, food stands, and attractions available to them were the "Village of Yesteryear," racing pigs, tractor pulls, demolition derbies, stunt shows, a petting zoo, dozens of rides, artistic and handicraft shops and displays, and a variety of musical performances. Melton McLaurin, The North Carolina State Fair: The First 150 Years (2003).